I can’t give you a crystal ball (wouldn’t that be handy? ), but I can perhaps give you the next best thing. I can tell you how to make a calculated guess at whether the interest rates are likely to go up or down in the near future. The banks employ huge numbers of economists who predict what the interest rate is likely to do. This is important, because the banks want to be in the know so that they price their lending rate appropriately. So, if you want to know what these economists are thinking, all you have to do is see what the banks’ lending rates are doing. Fixed rates are usually priced above the variable rate. This is because the banks need to work in some “cushioning” in case the RBA dramatically increases the interest rate during the fixed interest period of your loan. Variable rates are usually priced below the fixed rate, because the bank can simply adjust your lending rate as the RBA makes changes to the interest rate. If you look at the banks’ fixed rate and it is significantly higher than the variable rate, the economists think that the RBA is going to put interest rates up. If the fixed rate is somewhat higher than the variable rate, the economists think the RBA is going to keep the interest rate steady. If the banks’ variable rate is similar to or higher than the fixed rate, then the economists think that the RBA is likely to drop the interest rate further. Does that make sense to you? 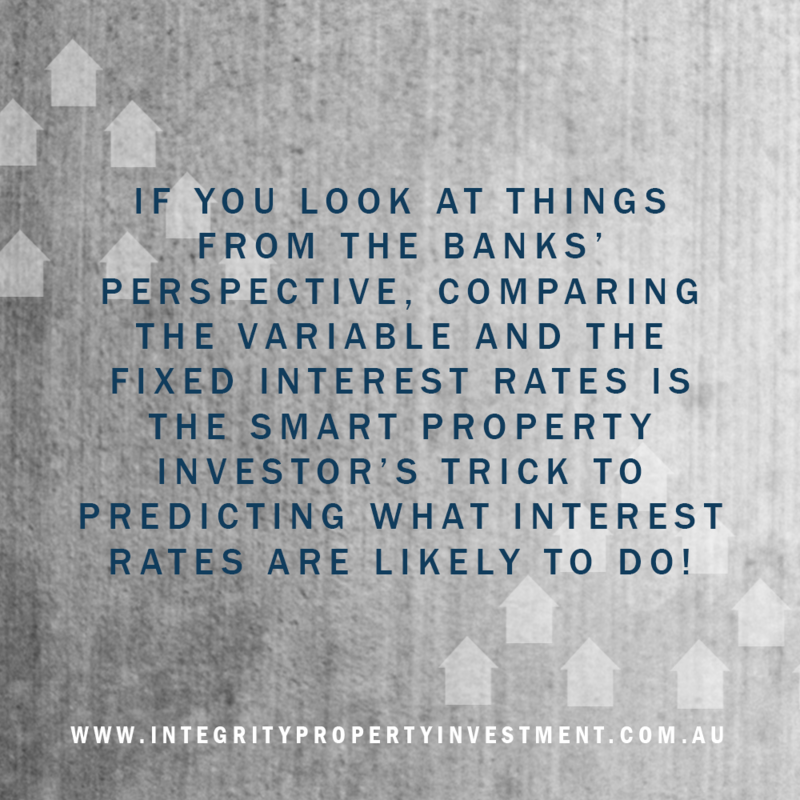 If you look at things from the banks’ perspective, comparing the variable and the fixed interest rates is the smart property investor’s trick to predicting what interest rates are likely to do! Previous post How Are Interest Rates Set In Australia? Next post Is Your Home An Asset Or A Liability?